A few months ago when I first saw the press release for William Woys Weaver’s latest book, As American as Shoofly Pie: The Foodlore and Fakelore of Pennsylvania Dutch Cuisine , I had to have it. As I may have mentioned before, I have a thing for cookbooks. Throw in a history lesson or two, and I’m clamoring for a copy. If you’re looking for a comprehensive history of Pennsylvania Dutch cuisine, this book is for you. Weaver delves deep into the culinary record of the Pennsylvania Dutch, beginning with their German roots. Years of research and interviews reveal that Pennsylvania Dutch cuisine is not all whoopie pies and fritters any more than it is entirely Amish. Weaver takes great care exploring the Pennsylvania Dutch communities and class divisions from the rural to the refined. The focus on history is important to note–this is not 300 pages of recipes with a little history sprinkled throughout. There are, however, several dozen recipes in the back, and these recipes are gold. 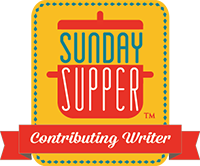 We’re talking about the sort of recipes that popped up in church cookbooks of yore and were nearly lost, except perhaps within a smattering of families where passed down over the generations. After reading through the book, there were so many recipes I wanted to try, I hardly knew where to begin. For example, the Baked Potato Fingers (Schpeckgrumbiere) immediately caught my eye. In Pennsilfaanish, schpeckgrumbiere means bacon potatoes. Why didn’t you just say so?! Any potato dish that starts with a slab of bacon has my attention, and these potatoes were divine. Then there was a “fancy” dish called Mock Rabbit or Blinder Haas. You might be surprised to find a healthy dose of freshly grated nutmeg in here, but when combined with ground pork, veal, and beef, along with some onion, the end result is a crazy-good meatloaf. Some of the other dishes on my “to try” list include the Amish Roast, which isn’t a roast at all, as well as Trinkle’s Lehigh County Corn Pie, Potato Pocket Dumplings with Sorrel Gravy, Chicken Gravy and Ham Waffles, and perhaps the Funnel Cake too. Then there is this Shoofly Pie. I have to admit, this was my first experience with shoofly pie, and I couldn’t be more pleased. Shoofly pie is more coffee cake than pie and is meant to be served at breakfast. This particular version is almost chocolatey with the texture of a moist and chewy brownie. Weaver is quick to point out that shoofly pie did not exist before the Civil War and was mostly a winter dish, as molasses was not available during warm weather in the days before refrigeration. 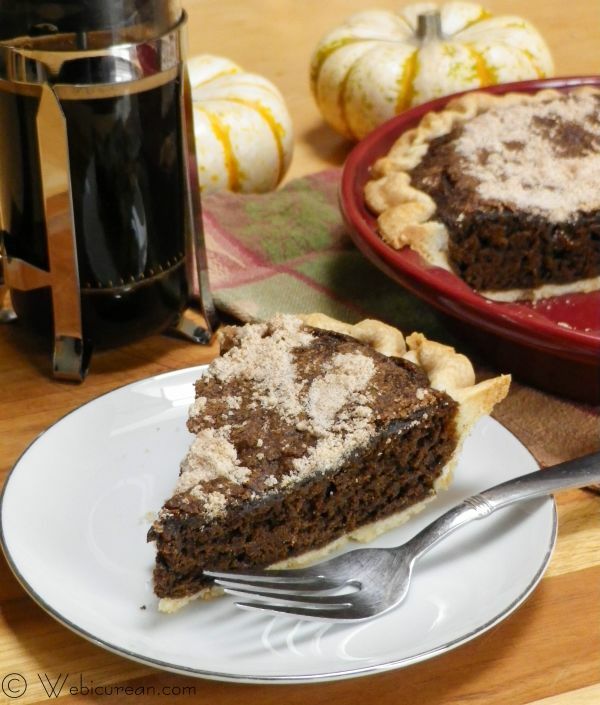 The pie was derived from the Jenny Lind pie and was originally called a “Centennial Cake.” In the past, it also popped up here and there as “molasses crumb pie” and “soda rivvel cake.” Today it is simply known as shoofly pie. Since the publisher inadvertently sent me two copies of the book, I’m giving one away–simply follow the instructions below. This giveaway is open to U.S. residents only. Combine the flour, sugars, butter, spices, and baking powder in a food processor, pulsing until a crumbly texture is formed. Reserve 1/4 cup of this mixture. In a small bowl combine the molasses and warm coffee, and stir until theÂ molasses is dissolved. Stir in the baking soda until it’s dissolved. 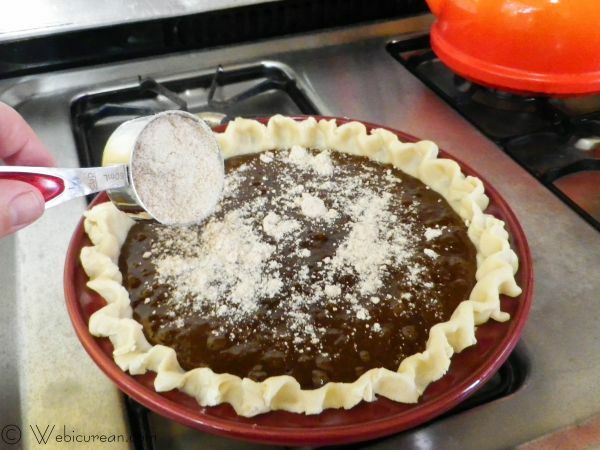 Then fold the molasses mixture into the flour mixture, and pour into a 9-inch pie pan that’s been lined with a crust. Sprinkle the reserved flour mixture over the top, and bake about 40-45 minutes or until the cake is done. Enjoy a big fat slice with a hot cup of strong coffee, maybe with a little whipped cream on top, if desired. So tell me, do you have a favorite Pennsylvania Dutch recipe? Use the widget below for a chance to win a copy of As American as Shoofly Pie: The Foodlore and Fakelore of Pennsylvania Dutch Cuisine by William Woys Weaver.Â Giveaway runs 10/13 thru 10/20, and is open to U.S. residents only.Â Winner will be chosen randomly and announced here. GOOD LUCK! Classic Pennsylvania Dutch Shoofly Pie, laced with cinnamon and nutmeg, is a breakfast treat best served warm with strong coffee. 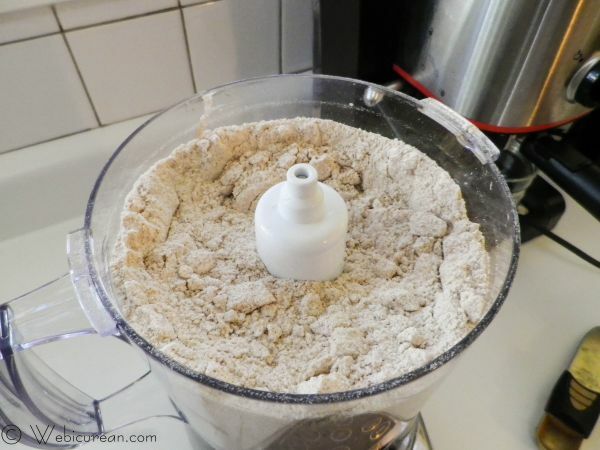 Using a pastry cutter or food processor, work the flour, sugars, butter, cinnamon, nutmeg, salt, and baking powder to form a loose crumb texture. Remove ¼ cup of the crumbs and reserve. In a separate work bowl, combine the warm coffee and molasses and stir until the molasses is dissolved. Add the baking soda, and stir gently to dissolve it. Pour the liquid into the crumb mixture and fold gently to combine well. Pour this into a prepared pie shell, then scatter the reserved crumbs over the top. 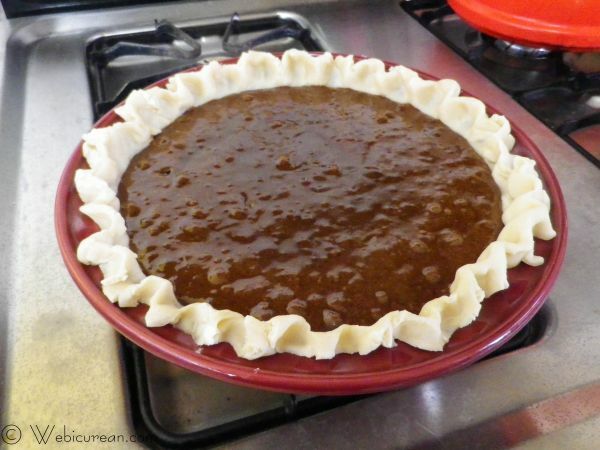 Bake the pie in the middle of the preheated oven for 40 to 45 minutes or until the center of the pie is firm and cakelike. Serve hot from the oven or cool on a rack and serve at room temperature. Note: Penn Press generously provided a copy of this book to review, and all opinions expressed above are my own. The Shoofly Pie recipe is reprinted here with permission. Also note, I earn a modest commission for any purchases made via the Amazon.com links on this page. by William Woys Weaver. (Penn Press; 2013; $34.95/ISBN 978-0-8122-4479-3). I love the Shoofly Pie. I make them all the time. This was my first, but I loved it and can’t wait to try other variations! Some of the ones I’ve seen almost have the texture of pecan pie–I need to try that version now! Favorite PA Dutch food: funnel cake or maybe funny cake! I can’t wait to try the funnel cake recipe–I’ll bet it’s better than the stuff you get at fairs! I don’t know anyone who can resist a whoopie pie! Of course, being a savory person, I’d be all over the bread every time! I know nothing about PA Dutch dishes, so I’d have to say this pie is my favorite! It looks terrific! The pie was quite good! Just got back from our first trip to lancaster yesterday – delish – whoopie pies are my fave for now – till I try this pie! Everyone loves a good whoopie pie! My mother is an avid quilter and very fond of all things PA Dutch. Old fashioned apple pie is a favorite. Apple pie is pretty awesome–we had a couple of apple trees growing up, so I used to make them all the time! I haven’t cooked much PA Dutch! I definitely want to, I need to learn more recipes, this looks amazing! I think PA Dutch recipes have been underappreciated over the years, so it’s nice to see them getting out there! The shoofly pie looks delicious! And I’d love to read about the other recipes too. I’m always a sucker for an interesting new cookbook. Too bad I can’t win this one because I’m Canadian! Thanks! And truly sorry about the US thing–this is my first giveaway, and I wasn’t sure what sort of complications might arise shipping outside the US. I was probably being overcautious. 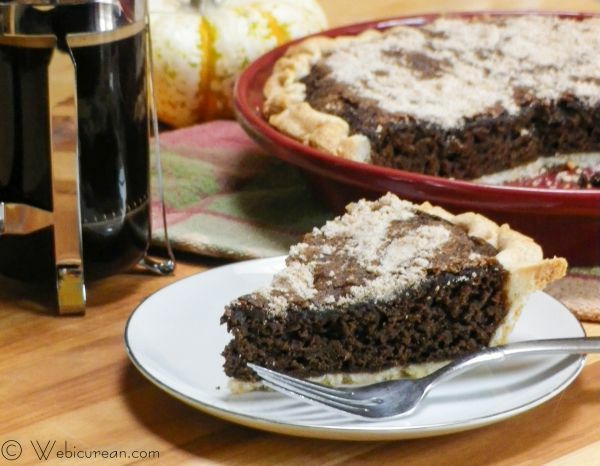 I only have made funnel cakes, but this shoofly Pie looks so delicious can’t wait to try. Oooh yum home made funnel cakes! Chicken pot pie is definitely a fave around here! I am not at all familiar with Pennsylvania Dutch cooking. Love when one finds something new like your delicious-looking Shoofly Pie. To be honest, I wasn’t all that familiar with PA Dutch cooking either until I picked up this book, and now there are so many new things to try! I love shoofly pie! Haven’t made one in years, but I have my grandmother’s recipe & now that you’ve reminded me, I need to make one soon! Her version has a gooey bottom layer & she called it a “wet-bottom shoofly pie.” I grew up in PA, but moved away 10 years ago – oh how I miss the PA Dutch treats! Yum! That’s next on my list to try! The best Shoo Fly Pie I ever tasted! Indeed delicious.